Last week I did start on new little punch needle designs for Christmas. No sneak peeks until nearer to Christmas as I plan to use them in gifts and I don't want to spoil the surprise. I can show you the lovely red fabrics I was tempted to buy. 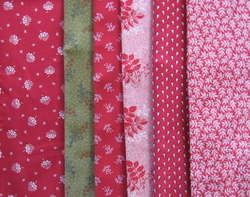 Jan rang and told me about the new fabrics that had arrived at the shop and how could I resist. The one on the left is my favourite. It's all gone now. The girls at my punch needle class on Saturday bought the last piece. The green is for Christmas and the reds for - well who knows. 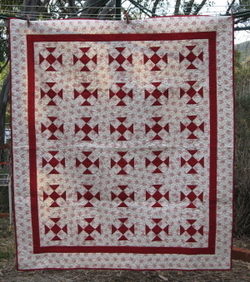 And here is my Shoofly quilt. I finished sewing down the binding at Christine's when I was in Sydney a fortnight ago. Yes, I should have done something about the creases before taking the picture. This is my favourite quilt, until the next one. And the winner of the Charli-Rose bracelet, designed by Roz is 'Bloom'. If you would like to email me your address I can post it to you. Thank you to everyone who entered the draw. The thing I love most about workshops are the wonderful girls you meet. And last weekend was no exception. There were the red hat ladies, the girls from Tasmania and many more. One of these lovely girls was Roz. 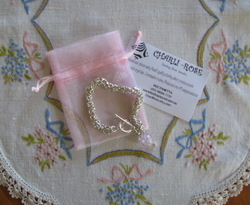 Roz designs beautiful sterling silver jewelry and has offered this gorgeous bracelet as a prize. If you would like the chance to win, please post a comment by next Friday, 16 November, to go in the draw. Well, the car is packed ready for another early start tomorrow. I'm heading to Warracknabeal for a trip down Memory Lane. Hope to see some of you there.